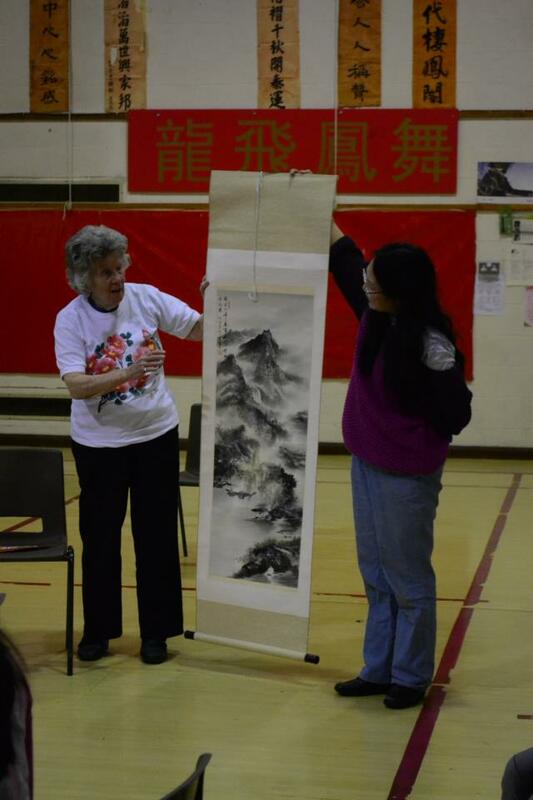 On Saturday the 6th of April, Pagoda Arts received a very special donation from Joan Patten; a Chinese brush and ink painting that she gained from her visit in China over a decade ago. Joan grew up in the heart of Liverpool’s China Town, as a young girl she remembers hearing stories of the bravery and honour that Chinese sailors showed for our country during the Second World War, the respect she gained for the Chinese community only grew as she began looking into the events herself. Upon arrival at the centre Joan was greeted with a chat and Chinese tea, through this talk Joan explained why she held the Chinese community in such high regard, speaking of her experiences as a young child and of her travels in China. After this Joan was introduced to the youth orchestra where she listened to them in a private performance before presenting the art work to the centre formally, explaining why she was here and the history behind her fondness for the Chinese community to the children, instructing them to never forget the work that the Chinese sailors working along with other ethnics on the merchants with the Liverpudians during the 2nd World War. On this special day, our young people gained a touching story of respect and a new view on our local history. “Donated in memory of and with honour and gratitude to the Chinese men who died at sea in World War Two, for a country not their own. All of us at Pagoda Arts were incredibly moved by this show of emotion and kindness and will honour Joan’s wishes and display the painting proudly within our building.